Your hosts; the five Rotary clubs of the Comox Valley have 5 days of exciting activities planned for you while you enjoy the hospitality of the Comox Valley. You will each be hosted overnight in the homes of local Rotarians. This trip is an opportunity for the Inbound Students to reconnect with their fellow brothers and sisters in Rotary Youth Exchange and to spend time with their Country Officer. It is a time to review the rules and to find out what we have all been doing since we were last together. There may also be a "Country Fair", where you will all have the opportunity to tell students all about your country and your exchange. We expect you to all come prepared for this event. To help guide you in what you need, click here to download our expectations. The cost including transportation has been paid by your club from their Annual Activity Fee. US Students will need to be at the COHO Terminal in Port Angeles by 7:30 AM for the 8:20 AM departure to Victoria on Wednesday. All US side students must have their passports, Canadian visa for required countries and the "Certificate of Eligibility for Exchange Visitor (J-1) Status" form (This should be stapled in your passport). No students will be allowed on the ferry without these documents. Check before you leave home that you have them! Canadian students will be picked up by bus at various locations as the bus works its way up-island and delivered to Comox Valley in time for Check-In. Students living in the Comox Valley and North will meet the group in Courtenay at a specified time and place to be announced. Trip up to Courtenay, with stops for lunch along the way. Upon arrival you will all wear your Rotary blazer/jacket and a nice shirt with your casual clothes you wore up island. We will be hosted for a family style dinner by the Rotarians and their families in the Comox Valley area. We will mingle (talk to different people) with our host clubs Rotarians. This is a time to get to know Rotarians and for them to get to know you. Before dinner we will present our own country flag (flags provided-no need to bring one). After dinner we will have an entertainment show (like at inbound orientation), bring any props, costumes, music, etc you will need to accompany you. At the end of the evening you will be home hosted by a Rotarian family, you may be alone or you may have one other student staying with you. Explore the Comox Valley. Activities planned may include swimming, curling, bowling; ice skating and lots of other fun things. A presentation to high school students about your country and your Rotary Exchange (bring your presentation with you - guidelines here). Dinner, an evening activity and then home to your host family. This is a day reserved for outdoor activities; A day at Mt. Washington is on the schedule; it will be limited to cross country skiing and snowshoeing. Plan B (if there is not enough snow) will be Strathcona Park Lodge and Outdoor Education Centre. Students must have outdoor clothing with a warm jacket, hats and gloves and an extra pair of sturdy boots or shoes. After returning Friday night will be a time to have dinner with your host family and get to know them. It is a good idea to bring a small thank you gift or thank you card for them when you leave. Meet some First Nation People and enjoy the music, dancing and customs of the Comox Band at the Big House and Orientation. Dress warm for this activity. Activities Saturday night: usually involve some group events for all the students; more details to be announced. Return home: US students will be on the 4:00 PM sailing of the COHO. Returning to Pt Angeles by 5:30 PM. Schedule to be announced. All U.S. students will be met by their host club drivers in Port Angeles by arrival time to transport back to their own homes. Click Here To Get The Most Current Clothing List! Thursday Activities: We plan on some morning Yoga and some line dancing so bring soft stretchy comfortable clothing. We will visit the large aquatic center for some pool time so your swim suit is a must! Then it's on to the ice skating rink, so warm clothes is the key. Later in the day you will be representing Rotary in the three local high schools. 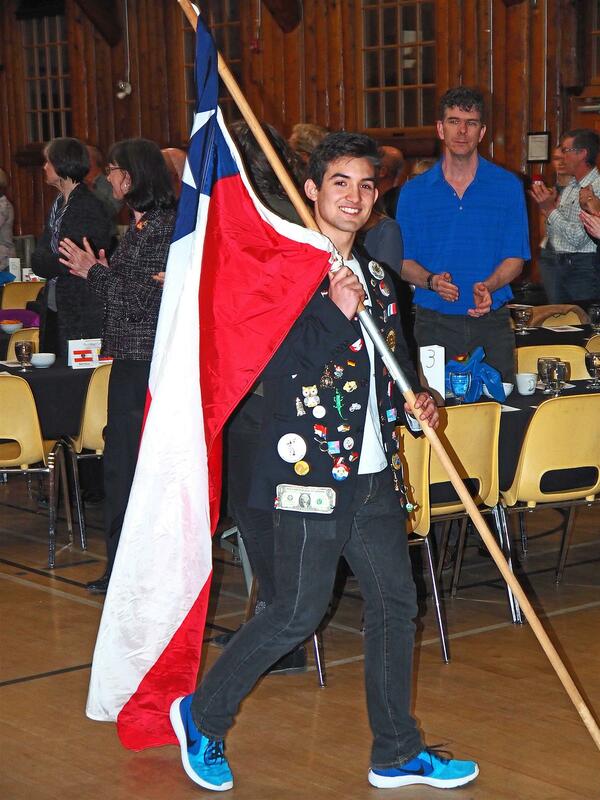 You will be expected to make a presentation with your Rotary Blazer (jacket) and clothes you might wear to school. Friday Activities: Clothing appropriate for outdoor activities. Shoes that are sturdy and can get wet. Warm coat, hat, gloves, and scarf. Saturday Activities: Warm clothes, spending money. Saturday Night: Casual clothing is appropriate. Check out the clothing list and share it with your host family; you will be able to borrow items you may not have! Thank you cards or small gifts for your Comox Valley Host Family. All meals will be provided by host families and Rotarians in the Comox Valley. If student requires a special diet, please note on the registration form. Students will be home hosted by Comox Valley Rotarians. 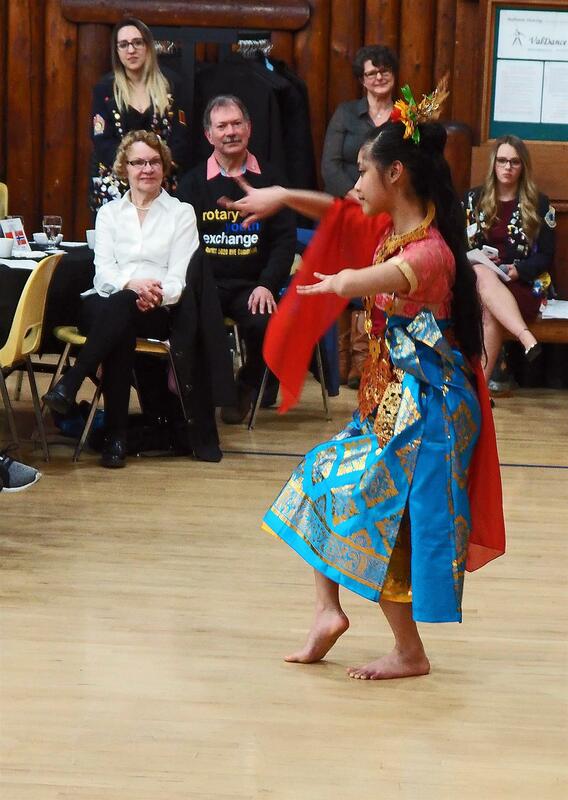 Students will provide an Entertainment Show for all Comox Valley Rotarians.